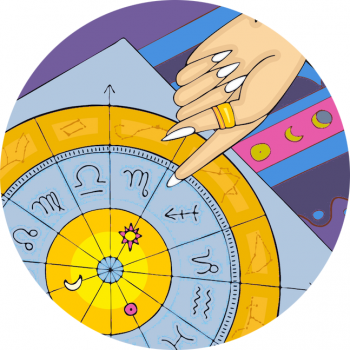 When drawing up a personal horoscope for the individual, one of the first things an astrologer will look at is the rising sign, located at the 9 ‘o clock point on the ‘natal chart’ or ‘birth chart‘. It’s this astrological point that symbolically represents our entry to the world. Our ascendant is the face we put on, the mask we wear and the general physical embodiment of ourselves and our approach – read more about the ascendant or rising sign, here. With the dreamy, watery planet Neptune sitting in your house of appearances others might view you in a distorted way – you could possess a face that looks like many people, familiar, and able to take on many guises. Kim Kardashian is an incredibly attractive woman who uses this to her advantage, able to be what the public wants simply by stepping out in style. Neptune governs dreams and fantasy, and people with this astrological placement could love escapism, dressing up in a fantastical style. I find it interesting that so many stars with this placement gravitate towards the Victoriana style of Alice in Wonderland, the most dreamy Neptunian character possible! They may have an aura or special quality about them that makes other people see them as a religious ‘guru’ type. Those Neptunian folk can be especially talented musicians, poets, artists or dancers. With Neptune confusing and blurring the waters in the house of ‘self’, a person with this particular planet in the first house could have a skewed view of themselves, a confusion that could lead body dysmorphia. Arguably EVERYONE in the public eye’s had cosmetic surgery these days but is it perhaps more popular with Neptunian people? The presence of the planet could also point to scandal. The watery planet Neptune governs the sea, so it’s possible that Neptune sitting so closely to the image we project could have a wet or tear-stained persona! Discover if you have Neptune on the ascendant in a reading with me, email kimberly@starsignstyle.com to arrange.